And though concerns about pricing and competition lingered through the end of 2007, Christmas was good — more or less — to storeowners across the city. 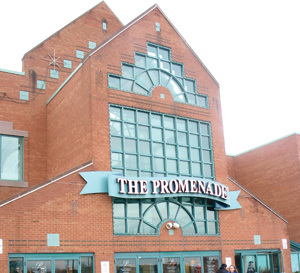 “By all accounts, it has been a very successful December for us,” said Andy Traynor, the Promenade Shopping Centre’s general manager. Traynor said he won’t see actual December sales figures until later this month, but “based on some observations and discussions with certain store managers” the indication is that “business was brisk”. That Christmas fell on Tuesday didn’t hurt either, he explained, saying the Thornhill mall benefitted from the late-season rush through the final shopping weekend of the holidays. Ironically, the Promenade also cashed in on the fall opening of Wal-Mart at Bathurst and Centre Sts. The retail giant has been a significant magnet for shoppers. While Promenade retailers did well in the run-up to Christmas, success was more modest across town at Woodbridge’s Zero 20 Bambini. “We were up a little bit for the month,” owner Santina Mariani said this week from her children’s clothing boutique on Pine Valley Dr. “We started our sales very early in December — we did 40 percent off in December, which is not something that I ever do and I don’t think I’ll ever do again because it kind of backfired on us. Mariani, who along with sister and partner Anna Turrin is celebrating 25 years in business, attributes the rollercoaster sales figures to a general confusion among shoppers on how prices are set. Customers always on the hunt for the next great bargain, she said, tend to overlook merchandise tagged at full price. “The concern about prices overall put a downer on the whole season,” she said. “We have to look at profitability, not what I turned (over). Adding to the pressure on the bottom line is the January “hangover” — the period in which retailers have to deal with returns, exchanges and gift card redemptions. Mariani said that while large retailers can more easily weather the post-Christmas period, boutique shops like hers struggle to keep up with customer expectations regarding returns and exchanges — expectations fostered by those same large retailers. While retailers like Mariani are doing what they can to cope with the January hangover, the growing popularity of gift cards is creating new challenges and opportunities. Traynor, who has been tracking gift card sales at the Promenade for several years, said he’s witnessed double-digit sales increases in what he called “the ideal gift”. Calling January a “clearance month”, Traynor said his retailers are now slashing prices on what they have left on their shelves in an effort to make room for new spring arrivals. At Zero 20 Bambini, Mariani said she’s doing the same, giving bargain hunters an excellent reason to cash in their Christmas gift cards.